Yoenis Cespedes (left) isn't intimidated by Dodgers aces Clayton Kershaw (middle) and Zack Greinke. Clayton Kershaw and Zack Greinke form one of the best starting pitching tandems in baseball history, but as far as Yoenis Cespedes is concerned when he faces them in the upcoming NLDS, they’re just run-of-the-mill pitchers. 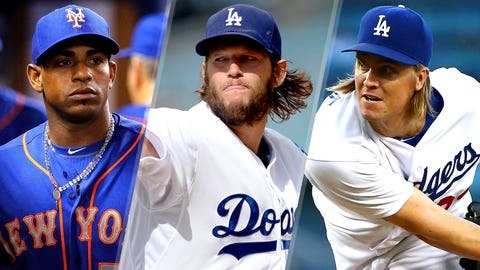 Kershaw, who led MLB with 301 strikeouts this season, and Greinke, who topped MLB with a 1.66 ERA – amongst other accomplishments – are slated to start Games 1 and 2 of the NLDS, which will begin at Dodger Stadium on Friday night. Having to face two Cy Young candidates on consecutive nights on their home turf could be an overwhelming matchup for any team, but Cespedes, who has sparked the Mets offense since the trade deadline, isn’t viewing it as such. "They’re pitchers just like anyone else," Cespedes said through an interpreter. "They’re going to throw the same pitches. I think the most important thing is to have fun." As for Cespedes’ status for the postseason after being hit on the hand by a fastball last week, the five-tool outfielder said he is "100 percent ready to start this battle" despite bruising on his left middle and ring fingers. After being acquired by the Mets at the trade deadline, Cespedes hit .287/.337/.604 with 14 home runs and 54 RBI in 57 games, inspiring an incredible second-half surge for the Mets. He hopes to take his productive bat into the postseason and deliver for his team in clutch situations. "I think with those big situations throughout the season I’ve had great opportunities to step up to the plate," Cespedes said. "I focus more, I concentrate more to help out the team."